Writing a collection letter requires you to follow the right step-by-step process and include the right language to give your customer official notice that a debt is owed and past due. You will typically send a total of four letters before hiring a collection agency or recording a bad debt expense. If you’re struggling to collect payments then we recommend using invoicing software like FreshBooks. With FreshBooks, you can create invoices, email them to your customers and include a payment link on the invoice so that your customers can make their payments online. Sign up for a free 30 day trial to see for yourself. There are four types of collection letters. Below, we have provided a free download to each collection letter template along with a brief explanation of when you should use it. 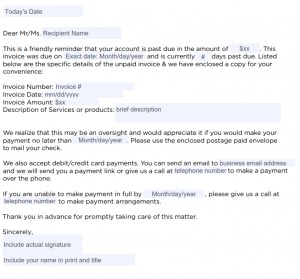 Download the First Collection Letter Template: This is the first collection letter that you should send to your customer once the invoice becomes 14 days past due. Download the Second Collection Letter Template: This is the second collection letter that you should send to your customer if you haven’t received a response within 14 days of sending the first collection letter. Download the Third Collection Letter Template: If you haven’t been able to reach your customer via telephone, and they have not responded to the first two letters you have sent within 14 days of sending the second letter, you need to send the third letter via certified mail. Download the Fourth Collection Letter and Final Notice: If you have not received any response from your customer within 14 days after sending the third notice, send this final notice to your customer via certified mail. Many small business owners dread the process of collecting payment on delinquent customer accounts. In addition to providing the free collection letter templates, we have also included best practices that you can implement to decrease the likelihood of having to do this too often. When writing a collection letter, your intent should be to remain professional yet firm. You want to let your customer know that you are serious about collecting payment while, at the same time, preserve the relationship. 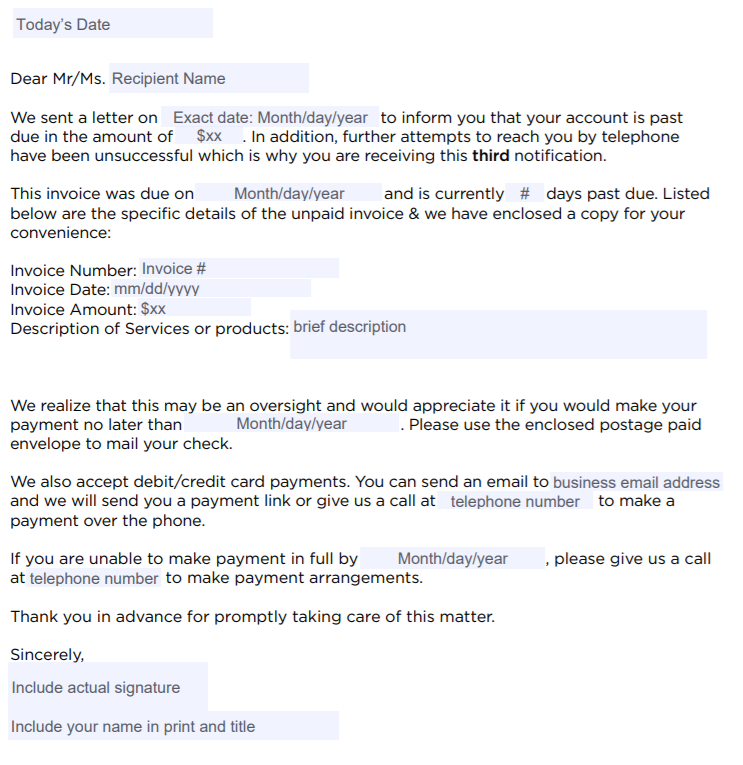 There are a total of four types of collection letters that you will send to your customer. Keep in mind that if your customer does respond to your phone calls or one of the letters, there is no need to send an additional letter unless the customer doesn’t follow through with payment. The first couple of collection letter formats are pretty light and the last two have a bit more aggressive language. The first collection letter should be mailed only after you have tried to reach the customer by telephone and email. If you use an accounting software like FreshBooks, you can email a friendly payment reminder directly from FreshBooks along with an attachment of the past due invoice. If the customer has not made payment arrangements with you after contacting them via telephone and email, you should mail the first collection letter. 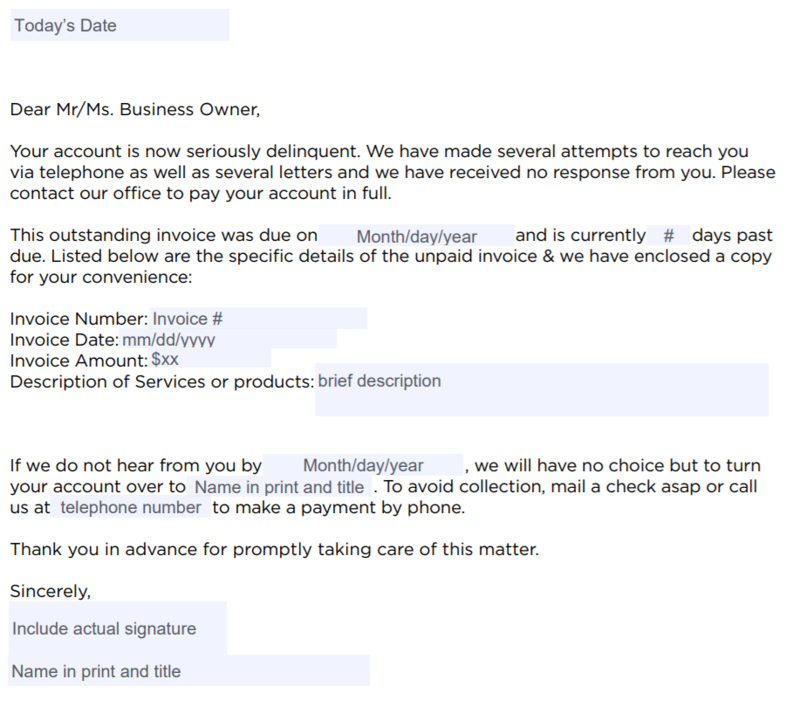 In general, this should be no later than 14 days after the invoice due date. Download our free first collection letter template and customize it to meet your specific needs. Make sure you use company letterhead that includes your company logo and business mailing address. Before sending a second collection letter, a telephone call should be made to see if the first letter was received and to see if the customer would like to make payment arrangements. If your attempts to reach the customer by telephone are unsuccessful, it’s time to send the second collection letter. The primary difference between the first letter and the second is that you will include the fact that you did attempt to reach the customer in the first letter. Download our free second collection letter template and customize it to meet your specific needs. Make sure you print this on company letterhead that includes your company logo and mailing address. After you send the second collection letter, you should attempt to reach the customer by telephone. If the customer has not made any kind of attempt to communicate within a couple of weeks, you need to send a third collection letter. Download our free third collection letter template and customize it. Similar to the second letter, you will include language to inform the customer that previous attempts via letters and telephone calls have been futile which has resulted in this third attempt. I also recommend that you send this letter certified mail. This will require that someone signs for the letter, and it will provide you with proof that the letter was received. 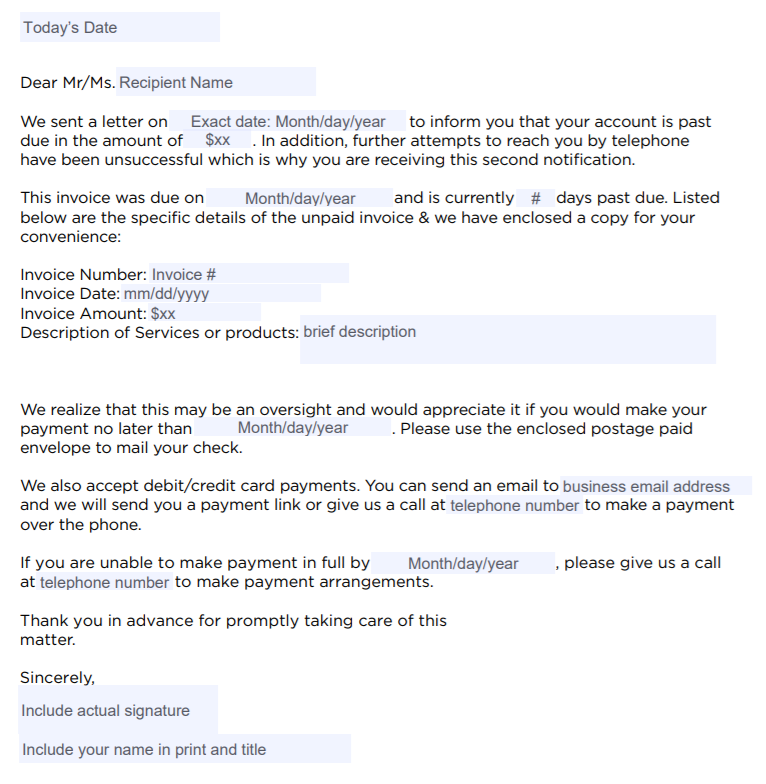 This kind of documentation will be important if you have to take legal action to collect this debt. While there may be some exceptions, by the time you get to a fourth collection letter, it should be painfully clear that your customer is either unwilling or unable to pay their debt. The language in this letter will be the most assertive that we have used but remains professional. Similar to the third letter, you need to send this final collection letter via certified mail. Download our free fourth and final collection letter template and customize it to meet your specific needs. After multiple attempts to collect on a delinquent account with telephone calls and letters fail, you should consider hiring a collection agency. One thing to keep in mind is that, once you hire a collection agency, you will not receive the full amount that is owed to you. Collection agencies generally charge between 25 percent and 45 percent of the total amount to be collected. Depending on the amount of the outstanding debt, this may not be worth hiring a collection agency for. If you decide to just cut your losses and not hire a collection agency, you should go ahead and write the account off as bad debt. This will at least allow you to claim a tax deduction for the amount owed to you. To learn more about how to write off bad debt, check out our Bad Debt Expense guide. If you’re in business long enough, you will likely run across a client that you may have trouble collecting payment from. There are a few things that you can do to minimize this from happening in the future. For example, you can offer early payment discounts and run a business credit check to see what kind of payment history a potential client has. The accounts receivable report is one of the top financial reports that you should review often. It includes the details of all unpaid customer invoices, including the invoice date, amount, invoice due date and number of days an invoice is past due. Most accounting software like QuickBooks and FreshBooks allow you to run an A/R aging report in just a few minutes. In our article on how to handle the A/R aging report, we show you how to read this report and what action you should take based on the age of an invoice. Consider offering customers an incentive to pay their invoices early. Early payment discounts can be anywhere between 1 percent and 5 percent and generally require payment within 10 days of the invoice date. A number of customers will jump at the chance to save a few bucks by sending in their payment early. Check out our Early Payment Discounts guide to see how this works. While it might feel a bit awkward at first, asking customers to put a deposit down before you provide goods and services is more common than you might think. For example, if a customer orders products, they usually must pay for their order in full (including shipping costs) before the product is delivered. In addition, most legal and accounting firms require a retainer before they will provide services to their clients. For example, let’s say that a graphic designer has a new client who wants a new website and logo design. The graphic designer has estimated that this project will take about six weeks to complete. Because this project expands beyond one month and it could very well take much longer, I would recommend that a deposit of 50 percent is provided upfront. This ensures that if the customer changes his or her mind or refuses to pay once the project is complete, the graphic designer will only be out about half of what the job cost. 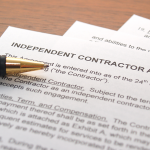 One of the mistakes that is often made is following up on payment in a timely manner. Unfortunately, because asking for payment is such a difficult thing for many business owners to do, they simply put it off for too long. To help you put the accounts receivable process on autopilot, you should consider using FreshBooks. FreshBooks allows you to send a payment reminder email to customers automatically before the invoice due date. I recommend sending this email at least two to three days prior to the due date. In addition, you can set up another reminder that will go out after the due date has passed. I recommend sending this out no later than one week after the invoice date. Keep in mind that these email reminders should not take the place of making telephone calls or sending collection letters. It is simply another way to try and collect payment before a customer’s account becomes delinquent. Similar to your personal credit score, you can run a credit check to see what a potential client’s business credit profile looks like, including payment history with trade partners. Access to how well a customer has met their payment obligations in the past is a pretty good indicator of whether or not you will get paid. Dun & Bradstreet is one reporting institute that compiles this data. A Dun & Bradstreet credit report compiles available data on businesses to assess overall creditworthiness. You’ll be able to see a full payment history of trade partners and financial institutions, including the number of late payments, of a client or potential client. You’ll know right away how much of a risk that business is to give trade credit to or how aggressive you should be in collecting payments. 1. If Your Customer Ends Up Paying You eventually, Should You Do Business with Them Again? This is the million-dollar question and my answer is “it depends”. In my opinion, if you are able to collect payment prior to sending the customer to an outside collection agency, then you should consider doing business with them again with the caveat that you will require a deposit upfront. If the customer is unwilling to put a deposit down, then I would definitely part ways. If a customer ends up making their payment through the collection agency, I would close their account and no longer do business with them. It really boils down to your history with the customer and whether or not you want to continue the relationship. 2. How Do You Select the Right Collection Agency? 3. What Best Practices Do You Recommend for Managing A/R Balances? We have discussed a number of best practices for managing accounts receivable balances; including using an invoicing software like FreshBooks and communicating with customers before their account becomes past due. If this is an area that you avoid like the plague, you should consider hiring someone to manage this process for you. 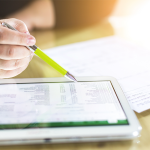 In our How to Manage Accounts Receivable guide, we share some additional best practices and some tips on hiring an accounts receivable manager. 4. How Much Does a Collection Agency Charge? There are two primary ways collection agencies get paid: flat fee vs. a contingency fee. Most of them charge a contingency fee, which means that if the customer does not pay, they don’t get paid. Contingency fees can run anywhere from 25 percent to 45 percent of the collection amount. It depends on a number of factors like how long the debt has been outstanding and how many attempts you have made to try and collect on the debt. We hope this information has helped to simplify the process of writing collection letters. The primary goal is to minimize the need to do this by implementing some of the best practices that we shared with you. Stay on top of unpaid invoices by using FreshBooks. In addition to creating professional looking invoices, you can set up payment reminders, accept online payments and prepare an aging report in just a few minutes in FreshBooks. Sign up for a free 30-day trial so you can see how easy it is to use.